I almost always stop at Kirby Storter when I drive across the Tamiami Trail between Naples and Miami. A boardwalk allows visitors to walk through thickets of sawgrass and clumps of willow, and into a deep water “cypress head” where they may see bromeliads, wading birds, and possibly an alligator or two. It’s a very pleasant walk. But sometimes I want to explore on my own, without being hemmed in by the constraints of a particular path. All around are Kirby Storter are sawgrass prairies. Dotting them here and there are dome-shaped concentrations of cypress trees called “cypress heads.” I like venturing into them to see what’s there. Even though each “head” is basically the same in shape and vegetative composition, every one is at the same time unique. Larger ones often have ponds of water in their centers. Those are sometimes homes to alligators, so it’s prudent to make one’s way into these places with due caution. However, the “heads” around Kirby Storter are small. I saw no ponds on the day I photographed this image. No alligators—or Burmese pythons, thank goodness. 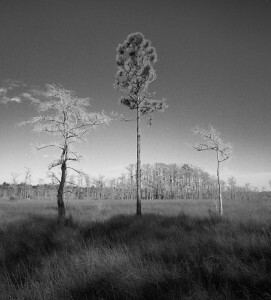 I encountered these three trees while hiking across the sawgrass prairie from one cypress head to another. Their triadic arrangement caught my eye. I found the variety between them to be attractive too. The group has cypress and pine. Each has its own shape, its own texture, its own line and pattern of growth. The square format of the image comes from the fact that I was using a Hasselblad SWC. The camera was a challenge to use, but fun. You cannot see through a SWC. There is no viewfinder. You have to estimate distances from the lens to the object being photograph. The lens is fully manual. It’s a far cry from the automatic readings of digital cameras, and even from automatic film cameras. To me there’s something special about Hasselblad optics. They have the potential to add a certain “sparkle” to an image. It’s hard to explain. There’s an unusual depth, an acute clarity, a character of three-dimensionality–a certain presence. There’s a delicacy to this photograph that really appeals to me. I like its simple elegance. 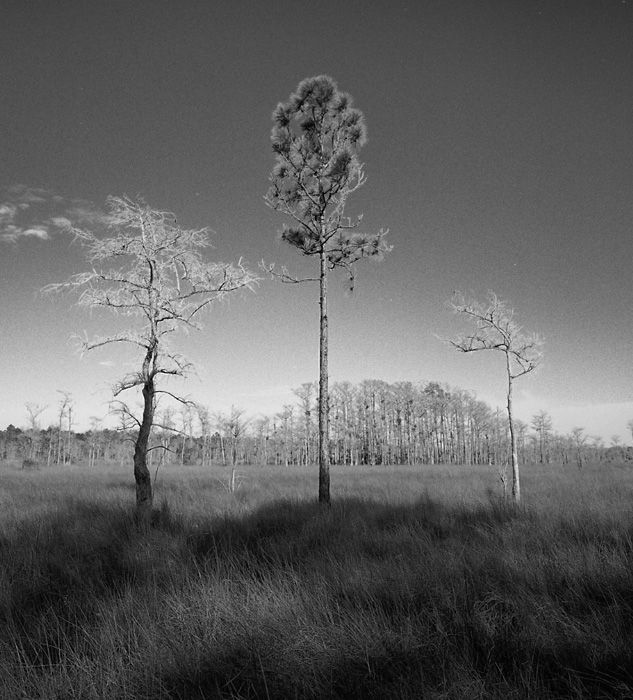 The Everglades is a special place. Its soft subtropical breezes, abundant sunshine, deep quiet, and many small beauties are well worth experiencing.